Ease: Electric Mixer Enthusiast Taste: Love it. Did you miss National S’mores Day (on August 10th)? We admit that we did. BUT, that doesn’t mean they weren’t on our mind. Well, when you’re done drooling over the pic above, it’s time to head out to the store and pick up a few things. Summer isn’t over till you say it’s over! I found this recipe on Sally’s Baking Addiction site (SallysBakingAddiction.com is well… addicting). The founder of Orlando Food Tours asked me to make this complicated, hours-long S’mores cake, which sounded/looked absolutely amazing (from another site)… so I made cupcakes. They’re just so cute. I would suggest baking this with your friends. It’ll speed up the process and be exceptionally more fun! This site has a ton of S’mores recipes, so if you’re not in the mood for cupcakes, you can make S’mores cinnamon rolls… pie… crepes… Before I lose you — one last note: keep an eye on your marshmallows, so they don’t burst into flames! 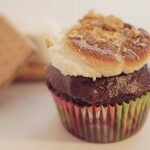 Woop, here it is: Marshmallow-Filled S’mores Cupcakes You have to let us know what you think!